Having trouble installing Xcode on Lion? Having just updated my Macbook to OSX Lion (yay!) 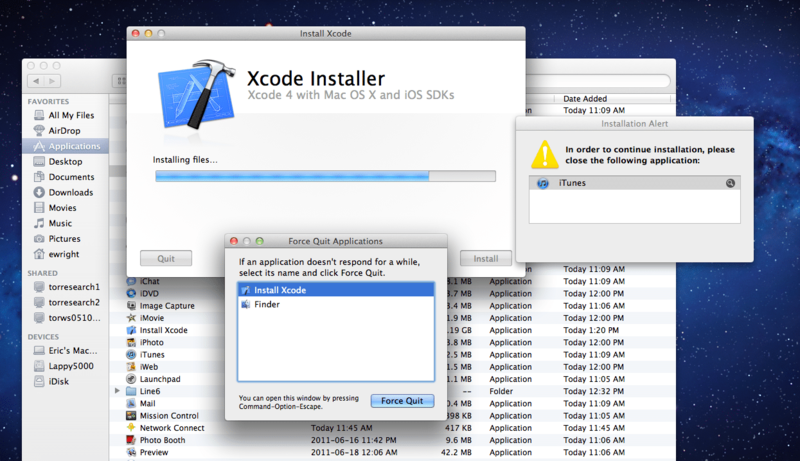 I found that there was an odd issue with installing Xcode which you may have run into. First I downloaded the Xcode app from the App Store; a process that I’m still getting used to from my laptop OS. That being said, it is pretty convenient to download and manage apps this way. Next step is to run the installation through the Install Xcode icon in the Applications folder. Then I walk away from the laptop for a while to let it work its magic only to find 10 minutes later that the installation stopped With the message “In order to continue installation, please close the following applications: iTunes”. Ok, but I don’t have iTunes running. No really, I mean it. Not even minimized like a Windows guy and forgetting it’s in the background, but really closed. Here is the catch. Although iTunes is not running, there is a process called iTunes Helper running in the background. This is the handy little tool that detects your devices and connects them. The solution is simply to go to Applications | Utilities | Activity Monitor and within the process list, find and Quit the iTunes Helper process which is running in the background. Now that you quit the process the Xcode installation will restart and complete without any further issues. You never see it coming, yet there it is staring you in the face. A perfectly frozen screen with no animation, no mouse movement, no keyboard response. The first thing you think is that it is just some errant process that ate up all of the resources and went off to chew on it in a tree somewhere. I took the first logical step. Hard power down and boot back up. We’ve all done it a number of times before. This time was different though and I immediately had that sickening feeling. The Apple logo screen and it’s little cutesy spinner were on the screen for around 5 minutes. My fears were realized soon after as the OS loaded after another 5 minutes only to hear the constant whirring of the hard drive and glacially slow response to mouse clicks in the UI. Here is my build and how it all went together. It is more for my own personal notes, but if you ever wanted to setup a Macbook as a Ruby on Rails development environment as well as a pretty solid Garage Band recording studio, this is how you can do it. And that, as they say, is that. One fully functional Ruby on Rails environment and one fully operational recording studio in a neat and tiny little aluminum case.